Science Talks in the World of Isagenix at Celebration! Isagenix® Science Talks are back and bringing Celebration attendees some food for thought. 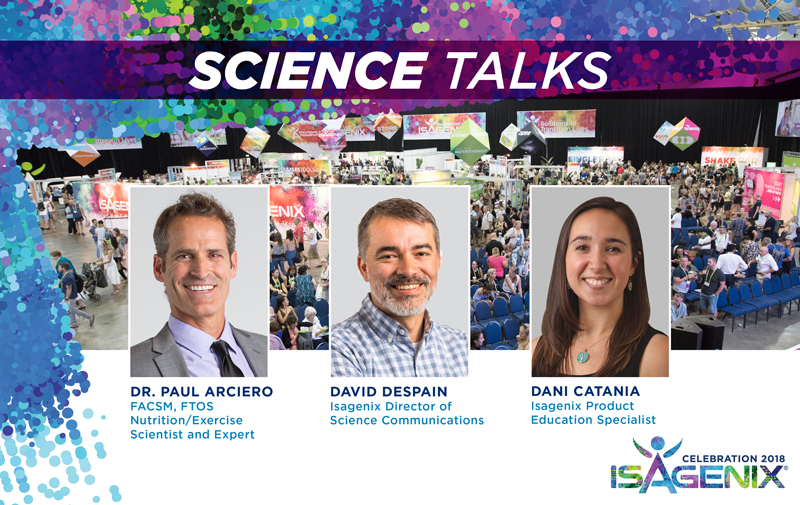 Nutrition and Exercise Scientist and Expert, Dr.Paul Arciero, Director of Science Communications, David Despain and Product Education Specialist, Dani Catania, will take to the Science Talks stage in the World of Isagenix to give you the scoop on all your favourite products. They’ll equip you with information on our no-compromise products, how to master Cleanse Days and more. Why Start Your Day with a Protein-Dense Shake? Brush up on your existing product knowledge or learn something new about our superior nutrition products from the best in the business. You won’t want to miss this opportunity, so if you haven’t purchased your Celebration ticket yet, head to ANZ.IsagenixEvents.com today before they’re gone!